Jasmin French is a Midwestern girl through and through! She was born and raised outside of Kansas City, MO and after ten years settled with her parents and her brother in Indianapolis, IN. Indiana proved to be a great place to grow up and it gave her some great experiences – from competing in pageants all over the state to a summer studying in France through Indiana University. 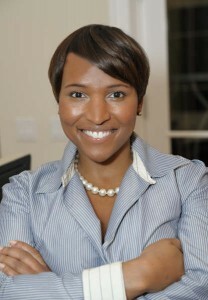 She graduated from Duke University with a degree in Public Policy and French (Go Blue Devils!) and saw first-hand the many doors a Duke degree can open. Whether it was a photo-documentary research project in Russia or a summer internship with Colgate Palmolive in Bangkok, Thailand – the currency of a degree from one of the country’s top institutions is always transferable. After three years in corporate America, she headed South again and earned her law degree from Vanderbilt University Law School in Nashville, TN. She’s had many mentors along the way but those whose words she still lives by: my parents (John & Mary) who never shushed their kindergartner whose teachers believed was too talkative and too bossy! After college, she had a great mentor while working at Kimberly-Clark Corporation. A great thinker, a great lawyer and a great person, he taught her so much about always being indispensible in whatever job she held. We interviewed Jasmin for this edition of women entrepreneurs and here are her responses on life and her business, J French. Be great at what you do and you will get noticed. Be great at who you are and you will be remembered. I created this motto to inspire my clients in their personal branding journey. But this is more than just a tag line on my marketing materials; I live by this motto because I know the power of authenticity. Intelligence and technical proficiency are important and really they are entry-level requirements to do well in life. But having those skills alone does little to distinguish you among the masses. Conversely, people who know their self-worth and share their God given gifts and talents with others are those that make a lasting, positive impact on everyone they meet. I strive to be that person everyday! J FRENCH is a personal branding consulting firm in Chicago, IL. Distinguished from traditional “image consulting services”, I equip clients with the tools necessary to develop a powerful personal brand, work a room, make a great first impression, improve public speaking skills and develop a polished image in person and on-line. I am a keynote speaker for universities, companies, professional organizations and non-profits. I also consult with clients one-on-one. Regardless of my audience, my message is about showing people how to determine what their value proposition is and then articulating that value via as many channels as humanly possible. I offer a holistic approach to leveraging everything that is uniquely exceptional about an individual to ensure that they are noticed and remembered. Generally speaking, I am at times rather risk adverse and thus would rather jump than be pushed… but the economic meltdown of 2009 had other plans. I was working for the largest law firm in the world, bringing home a six-figure salary and was doing interesting corporate legal work. That all changed on a Thursday in February when forty percent of my start class was laid off (including me). I linked up with a Chicago mainstay – the Women’s Business Development Center (WBDC) and after weeks of attending entrepreneurship classes, I decided to pursue my dream. I realized, I’d been talking about branding and the importance of presence and poise throughout my career – I just wasn’t getting paid to do it. I started, J FRENCH in the summer of 2009 and now I’m doing exactly that…getting paid! I had a fear of veering away from ‘The Plan’ that I’d laid out for my life. Naively, I worried that starting my own business, as opposed to working in a law firm, might throw off all the preparation I’d done up to that point. I was able to overcome those fears once I reminded myself that, “If you want to do extraordinary things you can’t take ordinary paths to get there.” The desire to pursue what compliments my purpose – far exceeds the shallow fear of veering off some pre-determined path. Growing up, I spent far too many Saturdays preparing to compete in various scholarship pageants. It was in those sessions, that I learned the importance of poise and presentation. I also learned the art of conversation and how to appear calm and collected even when all eyes are on you. Throughout my professional career, I’ve been awed by the number of doors that were opened simply by virtue of my ability to make a great first impression. [Scientific studies reveal that first impressions are formed in approximately 17-30 seconds. Yet, it can take up to 21 interactions to under a bad first impression.] When the recession was at its peak and the number of unemployed professionals reached alarming highs, it was very easy to see that a lot of smart, high performing people were out of work. I immediately realized the need in the Chicago market created by the highly skilled unemployed. I knew that everyone would be looking for an ‘edge’; a means to stand out and leverage what was unique about them in the face of record numbers of people looking for work. Filling that need is why J FRENCH was created. I am trying to be more creative. However, I have had some great luck with Help A Reporter Out (HARO) which allows reporters to email out their needs for sources and just by replying to an e-mail you can be cited as the source and your business can get some great exposure. I don’t have any employees. Day to day struggles include – lacking in patience to see my hard work come to fruition. When you’re toiling away day and night, it’s often difficult to wait the weeks or even months to see the fruit of that labor. I also struggle with finding the right balance and devoting an appropriate amount of time to working ‘in’ my business and working ‘on’ my business. It is difficult to stop and look up from marketing plans, invoices, updating my service offerings in order to set long-term strategic goals, reading books to expand knowledge areas, etc. First, I’d say that it’s having the confidence knowing that I’m amazing at what I do (it’s not bragging – but just being my loudest cheerleader). I knew I was smart, and when shown what to do, I was a good corporate lawyer. Amazing? That I wasn’t. Owning a business where my services are a direct reflection of God-given gifts – that’s what I call joy. I am such an extrovert and place a lot of value on friendships and family. I’m single – which doesn’t mean I don’t have family that means the world to me – but I’ve managed to find ways to enjoy friendships and the company of people I care about. How? I don’t get much sleep! People want to listen to those they trust. Do a self-inventory and determine what makes you credible. As a service provider, there is no product to stand behind – instead you are the central focus. Read often to fill in any gaps and ask a lot of thoughtful and insightful questions every time you’re in front of someone who is successful and respected within their industry. 1. Develop Your Pitch – Every new interaction is your opportunity to let the value of your brand shine. Take the time to sit down and develop your 30-60 second pitch (Every pitch should answer: Who You Are/ What need you can meet OR What problem you can solve/What is your value proposition/Who is your market). 2. Have a Plan – Turn the venue into a triangle. Make sure you visit each ‘point’ of that triangle in the room and talk to at least 2 people (1 on the way and 1 at each point). That way you’re sure to meet a different cross section of people. Jasmin, you always had your head on straight and was focused since our Duke days. I’m so glad that you are helping others find their unique gifts to share with the world! That’s what I’m talking about! Jas, is definitely someone to know! Jasmin, I was very impressed with your career and your answers. You are defintiely someone to know.